The Vanderbilt basketball team cannot seem to catch a break. 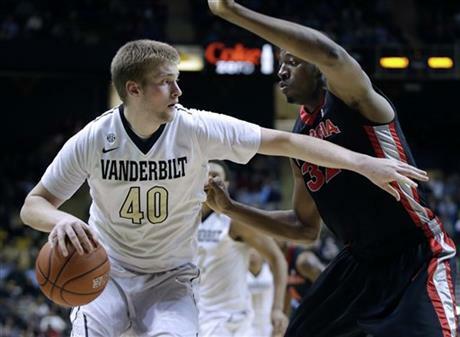 Thursday night Josh Henderson tore his ACL, MCL and lateral meniscus in first half of the Commodores 2 point win over Marshall in Memorial Gym. The 6’11 Junior Center will miss the remainder of the season and will need 8 to 9 months to recover from the injury. Henderson has been snakebit during his time at Vandy. As a redshirt freshman he only played in eight games after suffering a stress fracture in his right foot early in the season. The Roanoke native played in every game last season averaging 5.4 points and 3.4 rebounds per game. So far this season he had been averaging 6.6 points and 4.3 rebounds and was thought to be an important key to the team’s success. This is a big hit to an already thin Commodore team. True freshman Damaian Jones was one of the top recruits in the country and he was being brought along slowly behind Henderson but now he will be thrown into the fire right before we begin the SEC schedule next month. Jones has had a hard time staying out of foul trouble and will need to improve or will spend a lot of time on the bench. With only eight scholarship players on the roster Kevin Stallings will have his work cut out for him the rest of the season. James Siakam, Luke Kornet, as well as Jones will all see more minutes.